﻿Winnie the Pooh is a personified toy bear and the main character of Winnie the Pooh and Friends. He is naive, innocent, cheerful, friendly, thoughtful, and sometimes insightful; he is always willing to help his friends and try his best. A prime motivation of Pooh is his love for honey, which almost always leads to trouble. 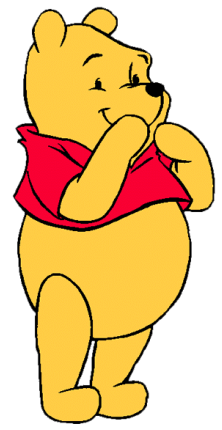 Pooh's obsession with honey and his round tummy can allow us to establish that he may have an eating disorder; specifically binge-eating disorder. According to Mayo Clinic, "binge-eating disorder is a serious eating disorder in which you frequently consume unusually large amounts of food and feel unable to stop eating." This is portrayed by Pooh who constantly and compulsively devours honey. In the movie "Winnie the Pooh" (2011), while the main characters are searching for Christopher Robin who may be in danger, Pooh cannot take his mind off his grumbling stomach that is yearning for honey. Pooh begins to hallucinate that Rabbit, Kanga, Roo, Piglet, and Owl are saying nothing but "honey". Pooh tries his hardest to think of Christopher Robin to remove his consuming thoughts of honey, but he cannot stop the hallucinations. Even though Christopher Robin is his best friend and he may be in danger, his desire for honey is too consuming for him to even care. His hallucinations further when Piglet, a toad, and the shadow of his hat appear to be a honey jar. He even sees flowers become jars that are pouring honey and bumblebees shaped like honey jars. His hallucinations come to a head when he sees a tree melt into a flowing fountain of honey. He joyfully basks in an imaginary land of honey, but as he guzzles the sweet nectar he returns to reality finding himself stuffing his mouth with mud to his disgust. Watch the clip below; Pooh's obsession with honey is utterly shocking and is grounds to diagnose him with binge-eating disorder. In fact, it can be determined that Pooh has an addiction to honey. According to Psychology Today, an addiction is "a condition that results when a person ingests a substance...that can be pleasurable but the continued use... of which becomes compulsive and interferes with ordinary life responsibilities, such as work, relationships, or health." Clearly, Pooh's addiction to honey interfered with his ability to find Christopher Robin, a relationship he supposedly cherishes.